I have done some additions to Diabolical:The Shooter but there is not much that I can easily show yet. The additions are a few more animations but they need a bit of adjustment before they are ready to show. These are the actions for changing weapon, reloading, melee and throwing grenades that needed to be merged in to whatever other animation was playing at the time. The throwing grenades needed some additional work to line up the point at which the grenade leaves the hand with the moment when the particle effect starts to show the grenade in motion in a nice arc. I was pleased with that and it leads me on to what else I have been working on... A tool to help create particle effects. 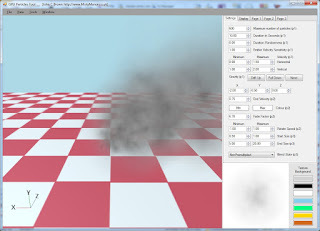 If you are not a game developer you may not be familiar with what Particle Effects are. This is really a technique for producing things like smoke and explosions, usually using lots of copies of the same image shown many times in different positions. Combining that in different ways can produce some very interesting and realistic visual effects. For performance I have elected to use particle effects that are mainly calculated by the GPU, the graphics card, rather than the CPU of the computer or in this case the Xbox 360. The disadvantage of using the GPU is that the effects cannot be changed once they have started. They rely entirely on mathematical formulae setup in advance. The advantage is that they have less of an impact on performance of the rest of the game. It's nothing grand but will do the job for me and I hope a few others may find it useful.